Thought I'd share this here, as I was surprised when nothing came up in a search. It's an open source IRC client for Windows and Linux, with experimental OSX support. 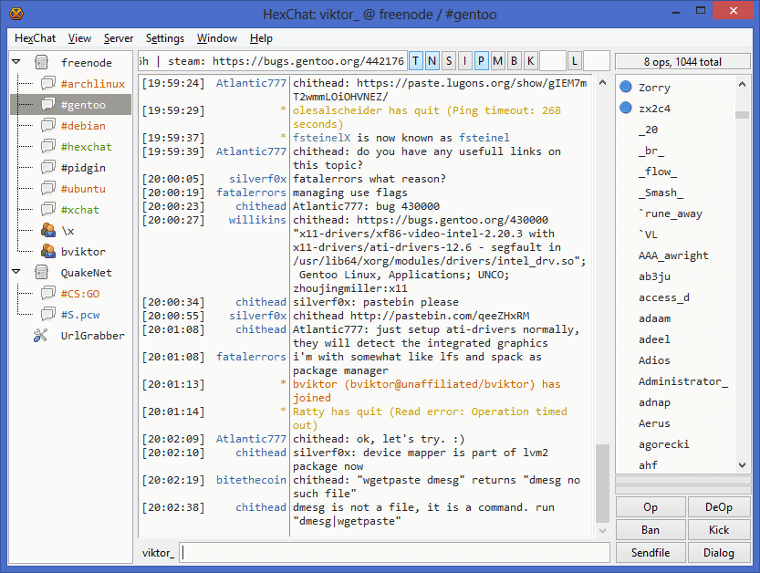 HexChat is an IRC client based on XChat, but unlike XChat it’s completely free for both Windows and Unix-like systems. Since XChat is open source, it’s perfectly legal. For more info, please read the Shareware background. In the installer (both x86 and x64 versions available) there's a portable install checkbox option, which states it contains everything in the app directory. I've checked with RegFromApp to see if there was any registry activity and nothing showed up. Seems portable. Specular wrote: I was surprised when nothing came up in a search. Cool, thanks for the heads-up. Been a long time since I've seen anything new on the IRC client front. But where is it writing settings? Tried installing it again under Sandboxie, changed a few settings and it didn't appear to write anywhere else according to the sandbox. Unless I'm missing something it seems portable, so I might submit it to the collection later. webfork wrote: Cool, thanks for the heads-up. Been a long time since I've seen anything new on the IRC client front. But where is it writing settings? It creates a 'config' folder in the app directory where the settings are stored. Looks good, thanks for doing that. Edit: here's PA thread on HexChat. also it creates alot of registry entries for windows mediaplayer and "FlowerSoft"
"DTDFile"="C:\\Documents and Settings\\HNIC\\Local Settings\\Application Data\\Microsoft\\Windows Media\\11.0\\WMSDKNS.DTD"
"LocalBase"="C:\\Documents and Settings\\HNIC\\Local Settings\\Application Data\\Microsoft\\Windows Media\\11.0\\WMSDKNS.XML"
"LocalDelta"="C:\\Documents and Settings\\HNIC\\Local Settings\\Application Data\\Microsoft\\Windows Media\\11.0\\WMSDKNSD.XML"
"RemoteDelta"="C:\\Documents and Settings\\HNIC\\Local Settings\\Application Data\\Microsoft\\Windows Media\\11.0\\WMSDKNSR.XML"
That's very odd. Nothing else popped up when I launched HexChat, and also can't find the 'FlowerSoft' entries in my registry. Did you install from the official downloads page, and if so did you add any additional plugins/options during or after install? and yeah I had all the xtra plugins going.